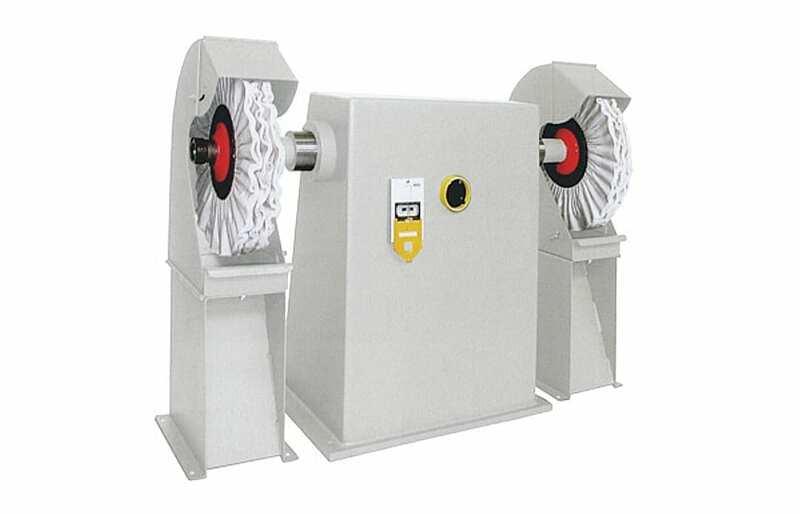 The belt grinding and polishing machines of the PM 75 series, with their low motor power, are inexpensive yet high-quality entry-level models. The PM 75 series is a universal machine for industrial use due to its double-sided design with optional combination of belt grinding and polishing, belt grinding only or polishing only. Three different speeds can be preset on the continuous shaft via a V-belt drive. The stable design of the PM 75 series ensures continuous vibration-free operation during the machining process. The belt grinding and polishing machine PM 75 can be equipped with a low column (600 mm) or with a high column (1,000 mm) of the stand. The machine is always supplied in a double-sided version. On customer request one side can be made “blind”. Thus, there is always a cost-effective and fast extension possibility available. The PM 75 series is equipped with a motor integrated in the stator and has a continuous spindle shaft. 3 speeds in the range from 1,200 rpm to 3,500 rpm can be set on this shaft. The accessories offered offer you the possibility of a quick conversion to other applications.